Now that winter is here, I am forever sipping on cups of tea. It's like the kettle doesn't stop whistling in my kitchen. I mostly drink green tea, sometimes Darjeeling, sometimes white tea and sometimes whichever flavour I fancy. People often look skeptical when I tell them that I am addicted to green tea. When they ask me to describe the taste, I really can't, but after drinking it for many years I can tell you it does have a certain taste and I do get cravings for it. It's a good thing that I have long back stopped adding sugar to my tea, otherwise there would have been serious trouble. But all that tea makes one crave for a treat, specially around the teatime, that sneaky time between lunch and dinner. Mostly I make do with biscuits, but some days I give in to the temptation and bake something quick to go with the tea. Before I share with you what I recently baked for my tea, let me tell you about an interesting foodie event I attended a few weeks back. It was a masterclass conducted by Signe Johansen and organised by Jarlsberg cheese at the Good Housekeeping Institute. 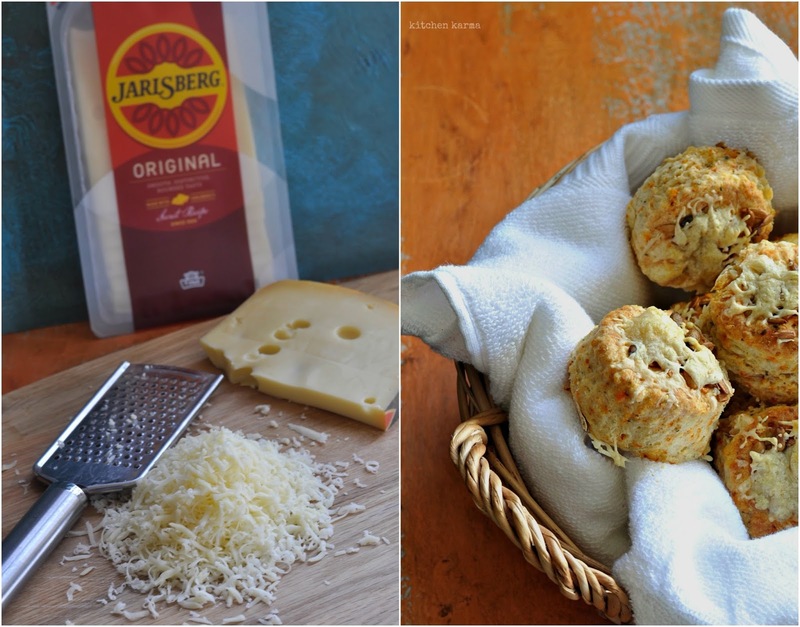 That evening we tasted some of Signe's cooking and learnt how to play with the very versatile Jarlsberg cheese. It's a Norwegian cheese with a slight nutty taste. What impressed me the most was how adaptable the cheese is. In the class we tried a wide number of dishes starting from the classic mac and cheese to using that mac and cheese to make quesadillas. What I realised is that the cheese melts really well so is a treat to bake and grill with. That is if you can stop snacking on it. There was some Jarlsberg in my fridge and before we could realise half of it was over just by snacking. I knew I had to use up the rest before all of it disappeared. Giving in to my savoury scone obsession, I decided to fiddle with my recipe and do another version. 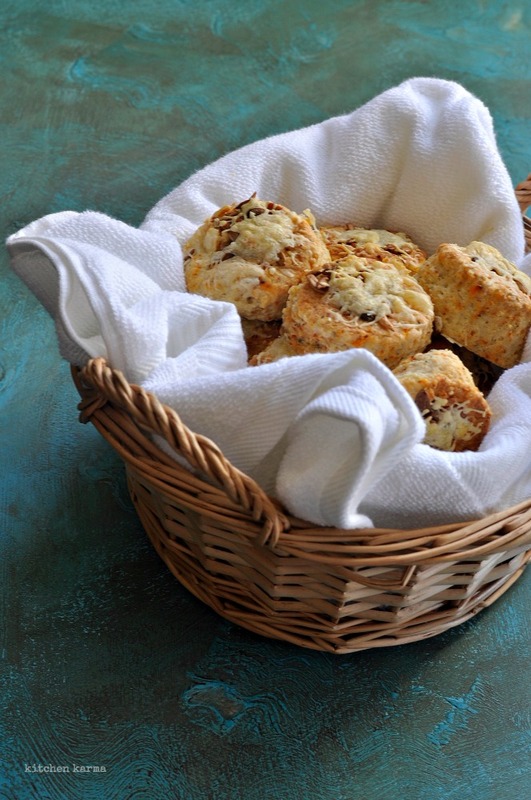 Remember my cheesy masala scone recipe from a few weeks back? Out went the old spice combination, in came dried fenugreek leaves, I can tell you they bring a depth of flavour to the scones. But do go slow on them, a little goes a long way and too much makes your food bitter. Also I added some seed mix to add a bit of crunch to my scones. This was inspired by Signe's scones which we tried at the event. viii. 1 table spoon of seed mix, if you don't have seed mix, dried & roasted pumpkin/ flax/ sunflower/ sesame would do either individually or in a mix. xii. Rest the scones for a few minutes before serving them warm with butter. Oh and don't forget to put on the kettle! You can serve them slightly warm or they even taste good cold. Of course it is traditional to serve them with lashings of butter, but frankly they taste equally good without any. Verdict: I am making these again, very soon. 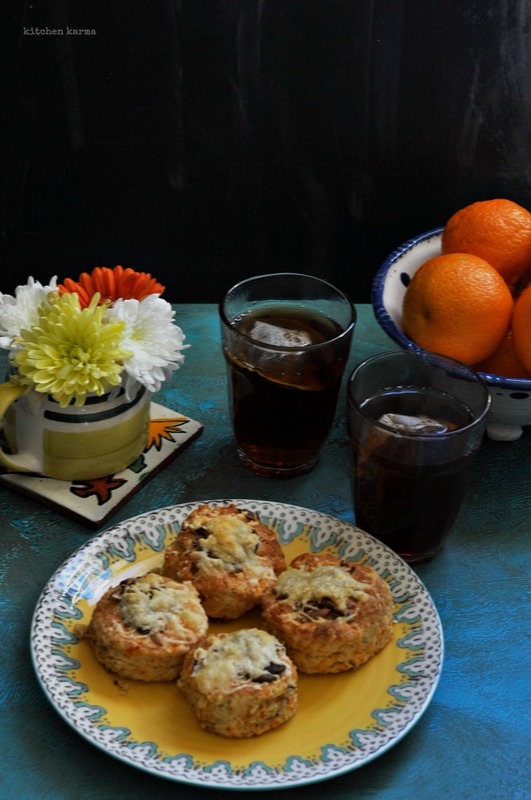 These scones are perfect to cheer up a dull winter teatime! Hi Suchi, your scones look awesome. I'm also a tea lover, enjoy green tea as well and alternate with earl grey, lemon tea, Chinese tea. Green tea is overall the best for our health. Its great to know that you too enjoy it.